You have been invited to attend a special event by the Foster School of Business. 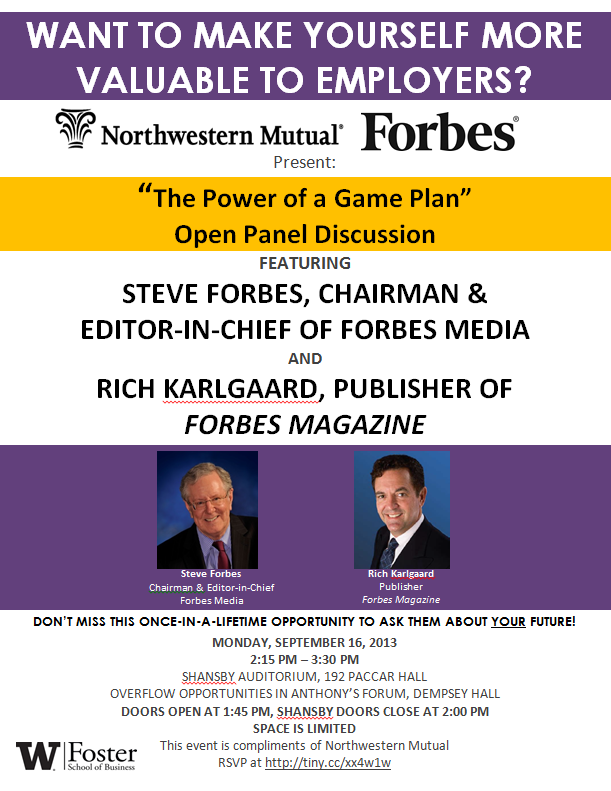 Do not miss this unique opportunity to interface with two successful visionaries in today’s business world: Steve Forbes, Chairman and Editor-in-Chief of Forbes Media, and Rich Karlgaard, publisher of Forbes Magazine. Please join us in welcoming them for the “The Power of a Game Plan” panel discussion onSeptember 16, 2013. Doors open in Shansby Auditorium at 1:45 PM. An event compliments of Northwestern Mutual, “The Power of a Game Plan” is a once-in-a-lifetime opportunity to meet with successful professionals face-to-face and ask them about their views of the international and domestic business outlook and how you can plan for your future. For no more than an hour and a half, Steve Forbes and Rich Karlgaard will share their views with you and will be at your disposal as they share their insights and answer your questions about planning for your future and how to prosper in today’s global environment. Steve Forbes and Rich Karlgaard are the powerhouses behind the largest business magazine in the world, Forbes Magazine. Mr. Forbes has also campaigned for President of the United States twice and has published five successful books. Want to know more? Learn about him HERE. Mr. Karlgaard is an author as well as an established entrepreneur: he has co-founded two companies and joined Forbes in starting Forbes ASAP, a technology magazine. He is a recipient of Ernst & Young’s “Entrepreneur of the Year” award. RSVP now at http://tiny.cc/xx4w1w as space is limited and seats will fill fast! We look forward to seeing you at this highly anticipated event.